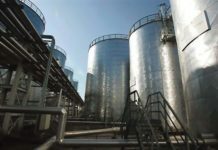 The saker falcon, a raptor under strict protection due to the threat of extinction, has taken up residence at the Płock refinery. 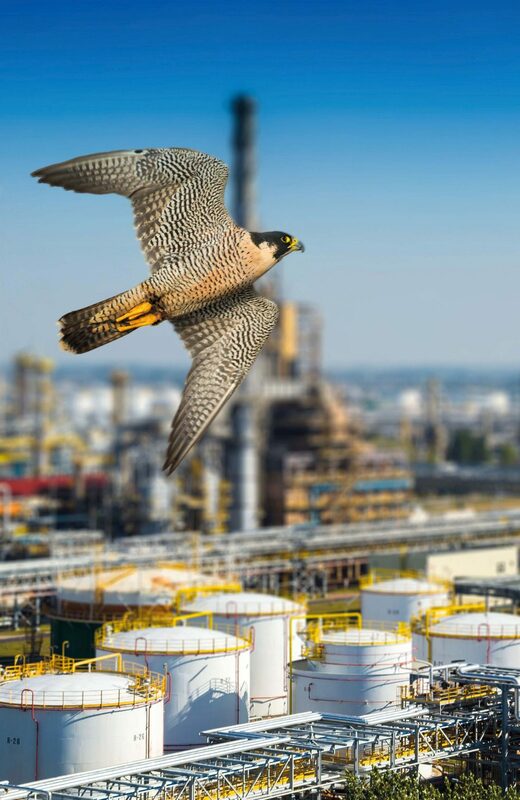 After a pair of peregrine falcons, this is the second bird of prey to choose the refining and petrochemical plant in Płock as its place of living and reproduction. The saker falcon is threatened by extinction on a global scale and subject to strict protection as a species. The raptor belongs to the falcon family and has been entered on the Red List of Threatened Species of the International Union for Conservation of Nature (IUCN). According to ornithologists, the nesting of this bird was identified only once in the post-war era, in the south of Poland, as our country is outside of the saker falcon’s natural habitat. However, some nesting of the saker falcon has been observed in the Czech Republic and Slovakia, where the population is growing slowly, so it can be expected that the birds’ visits, and perhaps nesting, could be more frequent in the future. It is a very tough raptor, which does not build its own nest, but lays eggs on cliff ledges or breeding sites of other birds. Perhaps this is why it took over the breeding site of the pair of peregrine falcons that had lived at the Płock refinery of PKN ORLEN for nearly 15 years, producing more than 40 offspring. Based on experts’ observations, the saker falcon tried to take over the peregrine falcons’ nest, located on a 160-meter tall chimney last year already, but was chased away. This year the takeover was successful and the female laid four eggs. “According to the Polish Avifaunistic Commission, ornithologists have recorded the presence of a saker falcon in Poland less than one hundred times. This is not a lot, given the fact that every observation is carefully verified. The saker falcon is partly a migratory species, which means that only part of the population – inhabiting northern parts of the globe – decides to travel south. The winter roosting sites of the European population are mainly in the Mediterranean area, and some birds reach the area south of the Sahara”, says Karol Kustusch from the environmental studies and surveys office “Avesnature” in Grudziądz, a company that conducted an environmental inventory-taking at the Płock facility. The bird, which is not ringed, has been given the name Raszka. The name was chosen in a voting contest among online users, in which more than 180 participants submitted 143 different names. Among other ideas, the fans following and commenting the saker falcon’s life online put forward names such as: Bystra, Elektra, Jagna, Lenka, Reszka, Cleo, Penelopa, Kropla or Moria. Saker falcons are subject to strict protection in Poland. The bird is also featured in Annex I to the EU’s Wild Birds’ Directive and the Bonn Convention on conservation of migratory species of wild animals that migrate outside the borders of national jurisdiction. “It is certainly an important ornithological event in Poland, and only the second nesting of this bird here. Throughout the observation period both using the Płock monitoring and from the neighbouring area, we were unable to identify a second bird. The female is probably alone and we do not know why she laid eggs. Perhaps another bird could arrive in the next years and they could form a pair, but we are unable to predict that right now”, said Sławomir Sielicki from the Society for Wild Animals “Falcon”, which looks after the pair of the peregrine falcons inhabiting the PKN ORLEN plant in Płock. The saker falcon is an even rarer species than the peregrine falcon. What is interesting is that based on ornithologists’ observations, the falcons named Rafik (from “refinery”) and Werwa (from “Verva fuels”), which were chased away by the saker falcon from their nest, have settled down in a different nesting box on another chimney – at the Claus unit of the Płock plant. “The peregrine falcon was sitting on the nest. Is the other one inside? Are there any eggs? We do not know that for now, but perhaps we will be able to find out soon”, says Sławomir Sielicki from the Society for Wild Animals “Falcon”. PKN ORLEN has been engaged in the programme for restoring the peregrine falcon population for 16 years. The species is entered in the Polish Red Data Book on Animals as CR: critically endangered. Two nesting boxes were installed on tall chimneys of the PKN ORLEN plant in 1999. The first one was put on the chimney of the CHP plant, and the second one on the Claus unit. The first breeding was recorded in May 2002. Since 2002, 42 peregrine falcons have hatched at the Płock refinery. Falconers claim that this is the oldest productive site in Poland, as offspring appeared every year, which is rare for this species. At the turn of 2015/2016, a new nesting box was installed at the chimney of the exhaust gas desulphurisation unit, equipped with thermometers and cameras for ongoing monitoring of the birds. The life of the falcons at the refinery is subject to all-year-round observation involving inspections of the nesting boxes, video and photographic records of the nesting peregrine falcon and ringing of the young birds. The colour of the ring depends on the place where the birds are set free. Observational rings have large letters and digits so that they can be read from a distance using optical equipment. 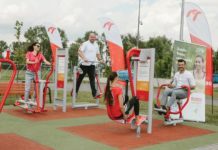 At the company’s initiative, an educational route was created at the square in downtown Płock dedicated to the peregrine falcons living at the Płock refinery, consisting of five information boards, a lifesize model of the peregrine falcon and an artificial nest, identical with the first nest placed on ORLEN’s chimneys. The visitors of the park can see a lifesize nesting box with an artificial falcon inside. The nest installed on the chimney can be watched online at www.orlen.pl / CSR / Falcon Nest and at the website of The Society for Wild Animals “Falcon”: perigrinus.pl. PKN ORLEN has been engaged in the programme for restoring the peregrine falcon population for 16 years.